Of all the dozens of healthy vegetarian soup recipes we've posted, here are the most popular recipes, according to you! All of these soup recipes are vegetarian, and most are vegan and dairy-free as well. Can't find the perfect vegetarian soup recipe? Here are a few more places to try: If you like cooking up homemade vegetarian soups (who doesn't?) or are trying to slim down a bit, you might also be interested in gluten-free vegan soups or fat-free vegan soups. 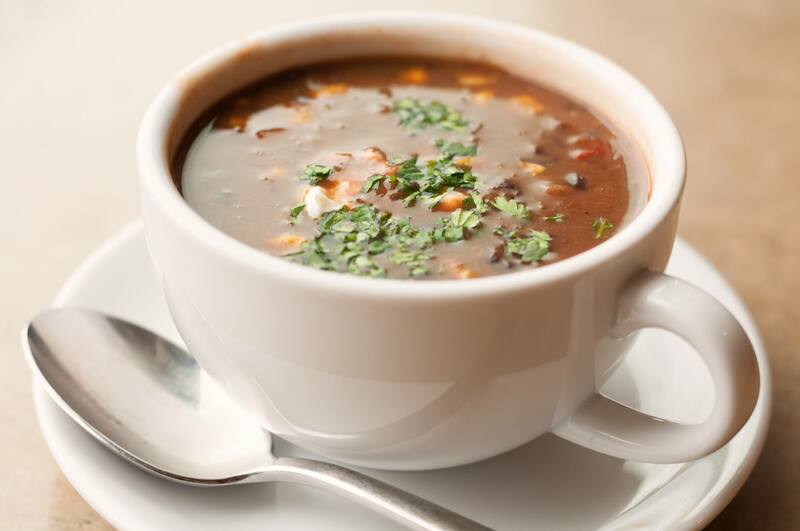 This quick and easy vegetarian black bean soup is a quick, healthy, low-fat vegetarian soup recipe that will warm up your family in less than 15 minutes flat. Make it vegan by simply omitting the cheese and sour cream Another great option is Mexican Black Bean Soup. Who needs the beef? This is a very hearty barley soup that is a full meal in itself, so you won't miss the beef, we promise! With this very versatile basic recipe, you can add just about any veggies you want—green beans, peas or corn would all work well. This bean and barley soup recipe makes a more than a generous amount, so plan on having some leftovers! Another option is barley and vegetable soup. Use fresh summer sweet corn when it's in season in this recipe, and frozen corn when it's not. Made with shallots, bell peppers, corn and a bit of cheese, this vegetarian curried corn and cheese chowder is a fantastic vegetarian soup which comes together in just about fifteen minutes. Oil-free, low-​fat and high-fiber vegetarian minestrone soup can be served either as a side or as an entree and is slowly simmered for maximum flavor. Try adding a bit of diced tofu or seitan for an extra protein boost. Serve with a side salad and some crusty French bread. You could also try crockpot minestrone soup. Traditionally, Thai coconut soup, or tom kha, is made with lots of spices such as galangal and lemongrass and also with chicken. This easy vegetarian Thai coconut soup is made with fresh cilantro, lime, and cayenne to duplicate the Thai flavors with some more commonly found ingredients. A reviewer said of this coconut soup recipe, "This soup is awesome. My husband and I both loved it." I also like to add some diced and sauteed tofu to coconut soup. There is also a vegan version. Even people who aren't vegetarian love lentil soup! There's just something comforting and familiar about a home-cooked bowl of vegetarian soup with lentils. Lentils are available in most grocery stores and very high in fiber and protein and are very inexpensive as well. This vegetarian lentil soup recipe uses plenty of spices, including thyme and bay leaves, to add lots of flavor. You may also want to watch this quick video which will show you how to make lentil soup step by step. You can also try crockpot lentil soup. When it comes to vegetarian soups, this one is a keeper. 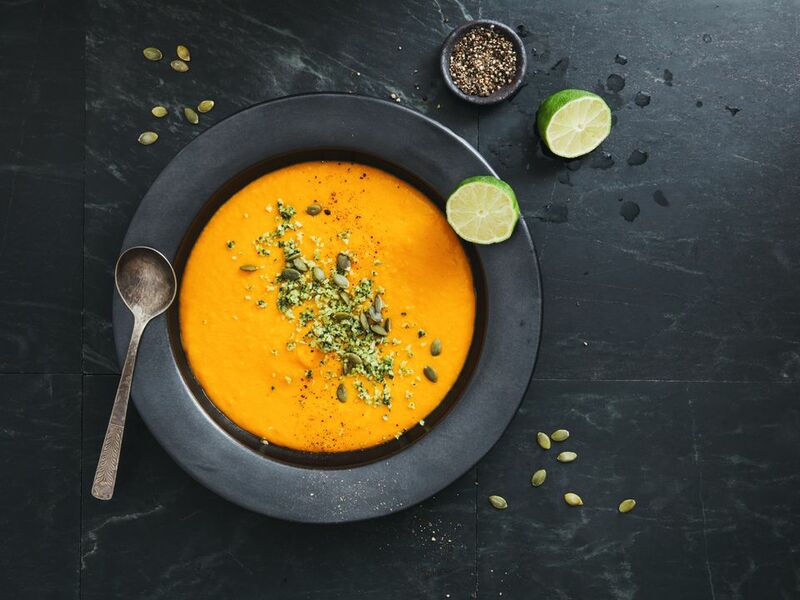 Users have unanimously given this creamy carrot and coconut milk soup recipe five out of five stars, so you can be sure that you'll enjoy this easy, blended carrot soup too.​ You can also try carrot, ginger and coriander soup. Inspired by the flavors of India and spiced with plenty of fresh cilantro and a dash of hot sauce, this is a fat-free vegan and vegetarian soup recipe that is also low in calories. Cabbage soup is incredibly healthy and very nutritious. It's made from just a few simple and familiar ingredients, so it's easy enough for even those who are new to vegetarian cooking. Vegetarian pumpkin soup is warming and filling. Perfect for the holidays or any time. This light pumpkin soup recipe is spiced with nutmeg and made with pureed instead of fresh pumpkin.​ You can also try pumpkin coconut soup. Gazpacho is a chilled Spanish soup that is refreshing on a hot summer day. This basic vegetarian and vegan gazpacho recipe can be dressed up with some croutons or hot sauce, depending on your taste. Don't be fooled by the long ingredients list, as gazpacho is a breeze to prepare. You can also use fresh cilantro in this recipe instead of parsley if you prefer. Soup is always an easy choice to make in a crockpot. Just add the ingredients in the morning, and forget about it until you are ready to eat it hours later. Although many split pea soup recipes use ham for added flavor, this vegetarian and vegan split pea soup version packs in the spices, including thyme, sage, and bay leaves for a lower fat and cholesterol version of classic split pea soup. Miso soup is so quick and easy to prepare that you can have it for breakfast. It's very warming and soothing in the morning, and because it's so versatile, it's easy to make it different every day by adding various veggies or extra spices. This basic vegetarian miso soup recipe is a simple version of the classic miso soup you'll find served in Japanese restaurants. Miso soup is my most popular vegetarian soup recipe! There are a ton of other vegetarian miso soup recipes. Chinese hot and sour soup is a light meal or accompaniment to eat any time of day. This hot and sour soup recipe is both vegetarian and vegan. It is somewhat light, however, so feel free to add in some tofu or seitan. This easy vegan cream of mushroom soup is full of delicious mushroom flavor and a creamy vegan broth!